RRB Group D Recruitment Notification 2019 for 10,0000 Vacancies – Check Result, Exam Dates Here!! Home » Latest Jobs » RRB Group D Recruitment Notification 2019 for 10,0000 Vacancies – Check Result, Exam Dates Here!! 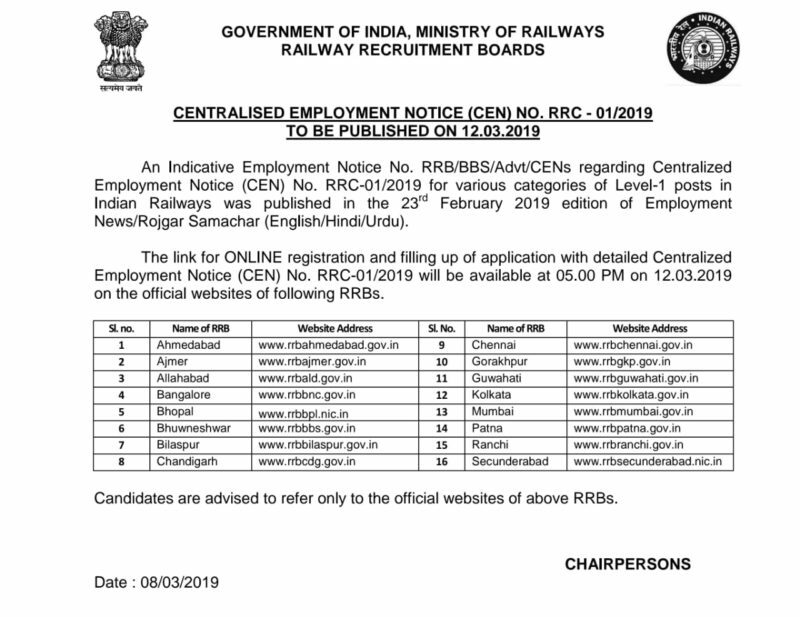 1 RRB Group D Recruitment Notification 2019 for 10,0000 Vacancies – Check Result, Exam Dates Here!! RRB Group D Recruitment Notification 2019 for 10,0000 Vacancies – Check Result, Exam Dates Here!! –The most awaited Railway RRB Group D Result is out! Railways Recruitment Board had released the official notification announcing the Railway RRB Group D Recruitment to fill 10,0000 vacancies. This is a golden chance to grab a well-secured job in the Indian Railways. Read further to know all about this Railway RRB Group D Recruitment which is the latest sensation of all the recruitment drives this year. Railway RRB Group D Recruitment has been announced to fill about 100000 vacancies. Given below are the Railway RRB Group D Vacancies with state – wise & category – wise distribution. You can check the number of vacancies for all states including Ahmedabad, Bhopal, Bangalore & Chennai. The lower limit of Date of Birth – Not later than 01.07.2000. The Upper limit of Date of Birth – Not earlier than 02.07.1984 (UR) 02.07.1983 (OBC Non-creamy layer) 02.07.1979 (for SC/ST). 1. If you are eligible for age relaxation on more than one ground, you will be granted the highest age relaxations (not cumulative). 2. No age relaxation is allowed to SC/ST/OBC-NCL (Non-Creamy Layer) candidates applying against unreserved vacancies. 3. PWD candidates applying against UR vacancies will be allowed age relaxation applicable for UR PWD only. 10th Pass plus National Apprenticeship (NAC) granted by NCVT or 10th Pass plus ITI from Institution recognized by NCVT/SCVT. You need to have a Distance vision of 6/9, 6/12, 6/18 according to the post you are applying for. You need to be generally fit in all physical aspects in order to carry out your duties efficiently. The Physical Efficiency Test will be qualifying in nature. Twice the no. of category-wise vacancies will be called for the Physical Efficiency Test. Lift & carry 35 kg of weight for a distance of 100 meters in 2 minutes in one chance without putting the weight down. Run for a distance of 1000 meters in 4 minutes 15 seconds in one chance. Lift & carry 20 kg of weight for a distance of 100 meters in 2 minutes in one chance without putting the weight down. Run for a distance of 1000 meters in 5 minutes 40 seconds in one chance. Put the given Captcha and click ‘Login’. You will be able to see your Application Status. Other benefits – Daily Allowance, Mileage Allowance beyond 8 km, DA, HRA, TPA (Transport allowance), Night Duty Allowance, Overtime allowance, and many more benefits. Note: Your Final Salary will be the Total of your Pay + GP + DA + HRA +TPA.